OCT scans can sometimes also reveal signs of other health issues elsewhere in your body, which is why your eyes are said to be the window to your health. Eye examinations are important not only to assess the health of your eye, but also your overall health. OCT technology mainly looks at your retina, checking for any abnormalities or damage. 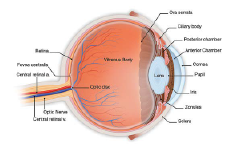 The retina can be damaged by many common diseases such as Glaucoma, Diabetes and Age Related Macula Degeneration. All of these can lead to visual impairment or even blindness if not detected and managed properly. OCT technology allows your practitioner to identify any potential problems at a much earlier stage, usually allowing you better treatment options and a better visual outcome. Just by looking at these images, this can help your practitioner to assess the health of your eye and identify any abnormalities or diseases. The test is very simple, takes just a few seconds and is completely non-contact, meaning there are no sudden puffs of air or flashes of light. Any areas of your eye which appear unusual can then be measured with the OCT and monitored over time with additional scans, at a later date. 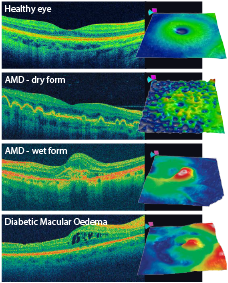 These scans can be lined up with the original and compared to see if any changes have occurred over time in your eye. An OCT scan is similar to an MRI or CAT scan for the eyes. OCT technology can image in 3D allowing your practitioner to see, sometimes for the first time, problems within your eye that could not easily be seen before.